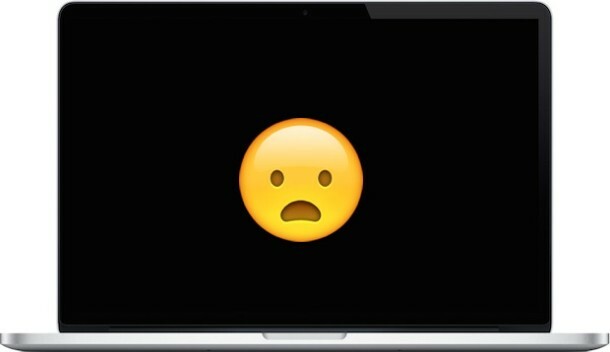 Apple is offering to repair certain malfunctioning MacBook Pro models sold between February 2011 and December 2013. 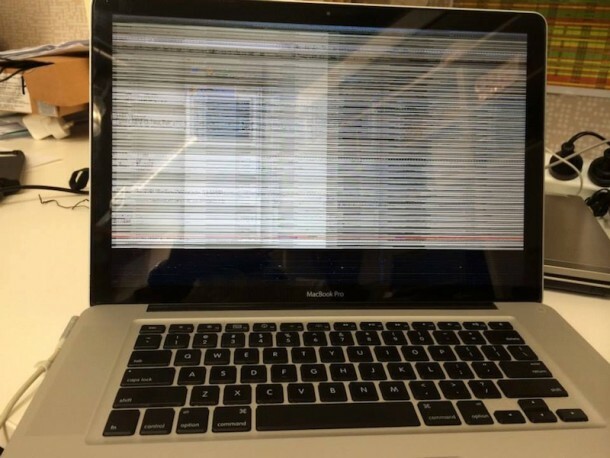 The impacted MacBook Pro models exhibit unusual graphics behavior, including distorted screen images, outright screen failures, and even sometimes unexpected system reboots. User can quickly identify their Mac model year from the About This Mac menu, but the best way to determine if your individual machine is eligible for repair is to check the warranty online by entering your computers serial number at this website on Apple.com. The repair service will be available until February 27, 2016, or three years from the computers original sale date. Macs that are eligible for service can either be brought to an Apple Store or mailed in, either method of repair will be free of charge. Be sure to back up your Mac before sending it in for service. More information about the repairs is available here on Apple Support. The above picture, which demonstrates just one example of what a malfunctioning MacBook Pro may look like, is courtesy of MacRumors. Apple initiates free repair programs from time to time when certain products are discovered to have issues. Another recent example of such a repair was the malfunctioning top button on some iPhone 5 devices. Thank goodness. Hopefully I won’t need it again. I’ve already replaces the logic board/gpu in my late 2011 15″ macbook pro twice now. Wonder if i can get a refund of the 300$ I spent? At least they didn’t charge me the second time. Finally, thankfully I managed to get apple care for my late 2011 15′ MBP since it dies almost every 6 months and during my thesis year, it was in and out from the service center due to the same reason. I bought an iMac as a result just to finish my thesis. I too had the same issue, except that I had the “smart board” replace multiple times. I was never charged for these repairs but it sure was a huge inconvenience. Found information about this issue on a FB page dedicated to this issue. When it hit the third time, the Apple store manager felt my pain and offered me a new MBPr at no charge. You can ask for more than that. You can ask for more than that. I meant to say “Can’t” ask for more than that. Apple really took ownership of the issue and took great care of me. Since then,…I have purchased three more MB’s for my family members. Wondering if they will be including the Mid-2010 MBP 15″ in this. I have a friend who has one that will randomly, for no reason, go “black” for about 5 seconds, and then the “white screen of death” with the “hit any key” dialog box comes up. It’s so consistent now that the machine is un-usable. There was already a quality program that was available for that model. That program is expired at this point thought… It was from 3 years of the date of purchase of the unit. MacBook Pro (15-inch Early 2011). No Video problems Until now but it still could be happening anytime. But wait I bought it Early 2011. So what’s the point of listing “MBP (Early 2011)” is eligible for service in the first place. If you would read the Apple page which I pasted the pertinent part for you below you will see you are covered. So from Apple to you 2Lips, FU! See the “Check your Coverage” tool on the Apple Support site. So what coverage you are talking about mr. HairLipHarry. Feel sorry for all thoose damn Appelloverboy’s. But why arguing about stuff that don’t even really matters. So peace to all of you out there. What a f*, Apple! Have a MBPro retina mid 2012 that is affected. After entering the serial # the side is saying telefon support, repair and service support is expired but I can buy a call to the support for 30 EUR! How to f* loyal customers and lose them. But with the billions made they give a goop. I imagine that would be done by car manufactures…. Why don’t you just call them at the toll free number for your area? Or go to an Apple Store or Authorized Repair center? Complaining doesn’t work as well. Because we don’t have toll free numbers here or at least I don’t find any on the Apple side for Europe and I don’t have half a day to drive to the next Apple Store to argue with them. Why not just accept the serial nr and date of purchase to route through for repair? That’s what I call customer support. Same here! My 13″ MBP early 2011 has had random screen scrambling problems along with the screen freezing and recently just started shutting down everything. I have not been able to find anything online stating that the 13″ are covered which leaves me wondering why it only applies to the 15″ and 17″. My 13″ also having same issues – Why are 13″ models not covered??? I’ve contacted Apple NZ explaining I’m having the same issues as 2 other people in my office (With 15″ models – who have both followed up the recall) but was told my machine is not covered. Same here, my MBP 13 inch Mid 2012 having the exact same problem. Did apple told you what causes the problem? Wondering why the 13 inch series is not covered in this repair extension program though. URI Did you change the motherboard? or they fix the video component in it? How is your MBP working now? i have the same problem with my MBP 13′ 2012 Mid. so stressful with the problem happening unexpected moment when you are using. Why it’s not covered but other models? I took my MacBook Pro to the Apple Store 02/24/2015 and they replace the board. However the problem started again so I took it back and they told me there is no way the board could be bad that they replaced.. Guess what? It was the replacement board and on 03/24/2015 they replaced the board again. Well, I am having the problem again and this is the third time which I will bring it in on 04/23/2015. Is there a limit to how many times they will replace the board before they give me a refurbished MacBook Pro and take this piece of junk back that they knew was defective? I have the same issue with my MacBook Pro. I took it to the Apple Store and they told me they do not cover the 13 inch MacBook Pro early 2011. I would have to pay $485 for them to fix it or $285 for an authorized dealer to fix it. What did you finally do? I’m facing the same issue and I don’t know if change the motherboard or just to buy a new laptop!! I have been to the genius bar over and over for 3 years and I’m pissed. I obviously was sold a faulty macbook pro and have expressed my frustration with no solution from apple. I will not by another mac after this nightmare. The 13″ was blatantly a ‘market filler’ for apple – the 15″ ones have two fans but the 13″ only has one because it’s size and design – sounds like yours is experiencing an overheating problem much like mine was. Mines a later 2013 model with an i7 cpu but I’m assuming earlier models probably suffer from it too – I installed some additional monitoring software on mine to actually see what the internal sensors were seeing (cos apple don’t let you see that normally as they don’t think you need to know) – wasn’t sure whether to have heart attack when I saw my cpu and gpu temperatures hitting 100 degrees C and steadily climbing or to grab the kettle and sit it on my keyboard to make a cup of tea!!! (in comparison, my tower pc hidden in a closed cupboard with hardly any airflow around it only runs at around 45 degrees) On the i7, intel list the max operating temp as 105 degrees before it issues a safety thermal system shutdown. Safe to assume my restarts were caused by that then! Then it dawned on me that it was taking a good couple of minutes for the fan to kick in and catch up with the temperatures. Installed a manual fan control application (easily found with a quick google) and set the speed to maximum before starting up a game to make the gpu work hard – temps did rise but low and behold, stayed stable at just over 80 instead this time – no more thermal cutouts since then! Apples official line on a tech thread was that they spin the fan up slowly to stop it from burning out … my official line is, the fan can be replaced for under $10 on eBay if or when it dies which is considerably better than a new cpu or motherboard! I bought a MBP 2011 early 13″. It is now a piece of junk!!! I replaced fan and logic board by cover under apple warranty. last night, just could’not turning on…. So damn tired of this !! My logic board was replaced with the program, free of charge. Different screen based issues/glitches has started again after about 2 months. I’ve found that making the resolution smaller ie 1680×1080 has fixed it so far. Not ideal, but at least I can work whilst am away from the city. I’m having exactly the same issue with a mid 2012 13″ MBP. Seems highly suspicious that it’s the same fault within the same manufacturing period, but somehow not recognised by Apple as eligible for repair? So frustrating. Same here. Late 2011 13″ MBP. Problems started a couple weeks ago. Strange scattered images within websites. Video freezing consistently when using Safari (looking at various sites offering high-quality platforms), which then locks up the computer for a few minutes at a time. I’m assuming this will only get worse from here out. Losing confidence in Apple. Miserable. I have the same issue with my MBP 13 inch. I lose completely my trust in Apple Machine!! I have MBP 13 inch also made in 2013 has video problem .per apple needs logic board replaced. It seems this logic board is from the same family that are faulty and apple replaced them. However apple does not want to accept this. Unfair behaviour from apple. To update this topic: Apple’s repair program for the video card issues that impacted MacBook Pros between 2011-2013 is only good through the end of December 2016. That’s the good news. Now for the bad news: There are some who report that Apple repeated the repair a number of times. The “repair” is to replace the entire logic board because the GPU is soldered on. Some MBP owners have had their MBPs repaired only to see the graphics problem resurface weeks or months later. So if you get a repair keep records. If an Apple-authorized repair fails enough times, Apple may comp you a replacement (new model). For those who have a MBP with video issues that is not covered by Apple, there is a service sold on Ebay that can probably also be found elsewhere that involves shipping your MBP off to have the video card re-soldered with lead solder (which is more heat tolerant than the newer more environmentally friendly solder material that is apparently at issue). One final FYI: These aluminum unibody cases are heat traps. In order to keep ANY MacBook cool, whether it’s covered by this service program or not, it’s important to practice good usage habits. For example, make sure not to block the ventilation on the bottom by making use of your MacBook on a soft surface (or even your lap for a prolonged period). Every 2 years or so it’s also a good idea to take a can of compressed air – not a vacuum cleaner! — and open up the back and make sure the dust bunnies aren’t building up to the point where it’s conducive to overheating. Computers are dust magnets and that dust will further impair the cooling that is necessary to keep the components from aging prematurely. Lastly, if your MacBook is over three years old and/or you are hearing an excessive amount of fan noise it may be time to have a authorized service center re-do the thermal paste. One of the issues that was suspected to be a contributing factor for 2011 MBP video issues, for example, was the over-application of thermal paste in manufacturing (which instead of helping it cool created more problems). Laptops, in general, benefit from having the thermal paste cleaned off and redone every couple of years (roughly 3 or 4 years in is probably a good place to start). If you’re handy, you can even do this yourself providing that you are comfortable dissembling your laptop/MBP (this will, of course, void any extended warranty you may have so keep that in mind). I repaired mine by following a Youtube video for replacing the thermal paste on the CPU in a MacBook Pro. I used a good quality paste and was amazed that it is still working. I hadn’t used my MacBook Pro mid 2012 in months because this horizontal freezing line problem would happen at random. I have maxed out the CPU with a simple ‘Yes’ stress test in Terminal and the laptop still happily works.